(12 April 1941 - 24 February 1993) was an English footballer. He captained West Ham United for more than 10 years & was captain of the England team that won the 1966 World Cup. He won a total of 108 caps for England, which at the time of his international retirement in 1973 was a national record. 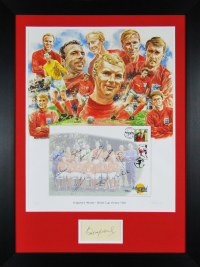 This site contains details and facts regarding Bobby's career as well as a shop that gives visitors the opportunity to purchase some very rare and exclusive Bobby Moore memorabilia. The site also gives visitors the chance to view highlights from Bobby’s finest hour (and a half), the 1966 World Cup Final against West Germany at Wembley Stadium. Check out the fact file with details of Bobby Moore’s professional playing career, and the teams he played for. The career and life pages contain details of Bobby’s football career as well as details about his life outside the game.